Many people in the non-AP world are surprised when I make mention of one of my children sleeping with me. 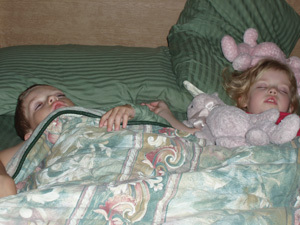 At 6.5 and 4.5 years of age, many seem to think that they are too old to be co-sleeping. Some of these parents co-slept with their infants but their children moved on to their own beds at some point. Mine did as well, but not for long. I am truly thankful that I fell into the attachment parenting practice when my first was a newborn, thankful for many reasons. These days I am thankful that I don’t have any preconceived notions of where children should sleep. This has proven beneficial not only to my children, but also to me. Both of my children have varying special needs but a common thread between the two of them is anxiety. My daughter, who is 4.5, is also language delayed. She doesn’t have a solid enough understanding of language for us to be able to explain the things that cause her anxiety and fears. As night comes, she quickly becomes more anxious about her surroundings refusing to leave our sides. For a family who forbids a child from sleeping with a parent, this would become a stressful time for both parent and child. When my daughter’s anxiety increased, it was simply a matter of bringing her back into our bed (she had transitioned to her own room for several months at the age of three). Now my daughter is able to get a full night’s rest without fear and so do my husband and I. My son, at 6.5, also has major nighttime anxiety. Although he has a vast vocabulary, he doesn’t understand why he is so fearful after dark. After sleeping in his own room for years, without any problems, he has also transitioned back into our room. Unfortunately he is plagued by vivid nightmares which continue even in bed with us. It pains my heart to see him thrash about and cry out in his sleep but I am happy that I am able to be near him and provide comfort. I know that our family’s decision to not place boundaries on our children’s ability to sleep with us is helping us all right now. If I were to insist that my children sleep in their own beds “like big boys and girls do” then no one, not a single one of us, would be getting any sleep. Nighttime parenting goes beyond the nursing years and does stretch into childhood and beyond. Knowing what your children’s needs are, and meeting those needs in a way that is optimal for everyone, helps the family’s bond grow stronger. Growing up, my parents had a strict “stay out of our room policy” which left us kids to rely on each other–or ourselves– at night. I always think of those scary, dark nights alone keenly aware that my parents were only a few feet away, but off limits and know that I would rather sleep share than make my kids feel abandoned and unwanted at night! Erring on the side of love is always the right choice for us– I don’t stop being a caring parent after dark and kids don’t stop having emotions just because I’m tired! It is obvious to me now that my parents must have considered our tiny childhood emotions to be frivolous, make-believe whims and that they had no respect for us as “real” people yet. It always makes me sad to think of my babies growing up that way. Thanks for sharing this story and for understating that the emotions of our children are real and deserve acknowledgment. Very inspiring post, your kids must feel so safe at night. A few times my toddler has woken up in a panic, crying for us and it meant so much to me that she was right there in the bed, and all she had to do was reach out her hand and roll over to snuggle against one of us and go back to sleep. Both myself and hubby would be so sad if she was in a room on her own, it just seems so right having a big crazy family bed! I couldn’t agree with you more (about co-sleeping beyond the nursing years). I am doing my best to encourage my family to co-sleep and to look beyond what a mainstream, non-AP approach tells us about what to anticipate for our children’s sleeping behavior. Right now I feel that it is the least I can do to comfort my daughter when she wakes up at night, and I hope that as she moves past the nursing years, that my husband and I continue to offer the same support that will help her build confidence and trust. Thank you all for your kind words and stories. I am a single mom of two kids, both of whom I coslept with when they were babies. I just felt more comfortable from birth knowing they were right there and nursing them as needed through the night. For about 6 months, that was wonderful. However, I did move them both into their own crib/room at around 8-10 months due to both of us just not getting enough sleep. With my son, I was working on my undergraduate degree and with my daughter I was in grad school, so sleep was vital. Now, they are 2 and 4. They sleep in their own room but scream and cry at bedtime. Transitions for both of them have always been difficult, but I am finding myself being very frustrated and overwhelmed on a nightly basis. It is a battle that lasts for up to an hour every night. I know that when I have let them sleep in my bed in the past, they and I dont sleep well. We wake each other up and toss and turn all night (it doesnt help that I talk and sometimes walk in my sleep and my kids talk in their sleep). I really want to get over this hump and start being a more loving caregiver at bedtime, but I have been finding myself yelling at them when they are injuring each other to get my attention (i.e. the two year old bites and the four year old punches) at night. I am now working full time as a social worker and only get to see them about 3-4 hours a day, tops, and every other weekend their dad has them. I really dont want this to keep up- I miss them so much when I am at work and when I get home to this defiance and struggle it just feels so defeating. Any advice would help- miriamebowman@gmail.com. I love what you said about “being a big boy/girl”. I have been pushing my almost 3 year old a bit to go to sleep by himself and he was fine with it for a while, but recently became completely intolerant, clinging desperately for me to stay in bed with him. I found myself telling him that he is a “big boy, and needs to go to sleep like a big boy . . . ” and he said back to me, in the saddest tone ever, “no. I’m not a big boy. I’m not.” And it hit me like a ton of bricks. He’s right. He’s a little boy and he needs me there with him. Our first daughter slept in our room until 4months and we then transitioned her to her own room. We were not at all familiar with attachment parenting concepts or practices until she was much older. I continued to breastfeed on demand and we would go to her whenever needed. This seemed to work well for a long time, she actually liked her crib and would ask to go to sleep. Just before she turned 2 however, this changed. I was pregnant and whether she sensed something was changing or it was just her age she developed very pronounced separation anxiety and night and would wake up crying for us on a regular basis. We tried a lot of different things including letting her cry it out one night. (One of my biggest regrets as a parent so far) It was awful, she acted funny the next morning; I think she truly felt abandoned. The only thing that worked was when we brought her back to our bedroom. It got better for a while but then it stared all over again when the baby came (not surprising). By this time we were much more aware of AP principles and practices, just stumbling across it through our parenting journey as we have found it to fit with our values and style. Recently I have made a more specific effort to understand fully the concepts and practices behind AP and have realized how important it is for babies and children to feel protected and cared for at all hours of the day and often continued cosleeping is part of this. She still has bad dreams sometimes but is overall much more at ease with bedtime and settles back to sleep easily. Night terrors are often a symptom of celiac disease (extreme sensitivity to wheat gluten). I grew up with these night terrors, and FINALLY at 36 years old, I realized I was celiac. No bad dreams since. My 3.5 year old is still nursing but I’ve had to set limits (wake up time, nap time, bed time) since we now have a 5 month old baby sister. Big sister has consistently had these limits for 4 months. I started sleeping in a different room with the baby because big sister would wake up to nurse every 2 hours and I wasn’t getting enough rest r giving enough attention to the baby. I explained it honestly to big sister. Occasionally she throws tantrums because she wants mamma even though she still co sleeps with daddy. Do you have any positive behavior advice to help her with this? I wouldn’t mind sleeping with both if she (big sister) could stop night nursing with me next to her. These comments are helpful, but I’m also feeling conflicted around how this aligns with my most basic sleep needs. I had longer-term sleep deprivation with a child who would wake up every 2-4 hours through the night for two years (I was home with her during the first 2 years and now work full time). My daughter continues to have consistent difficulty falling asleep on her own…but each time we bring to her to bed, I ending up waking up several times through the night each time from her delicious requests for hugs, accidental kicking, sleep talking, poking, punching, etc. It doesn’t help that I’m a light sleeper. If I put a twin next to her crib, I’ll have no time to get items done as a working parent who isn’t able to take day breaks in an effort to have work-life after-hours (this job only started 10 months ago, and her night needs for more attention haven’t increased – just the same, perhaps because I focus my time with her the moment I get home until she goes to sleep). Any ideas on what I can do – other than quitting my job? !